I have a list of items. You can either ship all items or select the ones to ship. I want the disabled 'Ship Selected' to be visible because I want the users to know they have that option (another queue beside the checkbox next to it). Have 'Ship all' still available but add a secondary button styling. Personally (and of course, "I am not your users"), I don't see much wrong with leaving "Ship All" enabled. If you're worried about people accidentally clicking "Ship All" after they've made a selection, you might either want to ask if that's what they really want to do, or just make it very clear on the next screen that's what's going to happen so they can back out and re-select. Changing the "Ship Selected" button label to include the number of selected items (e.g. 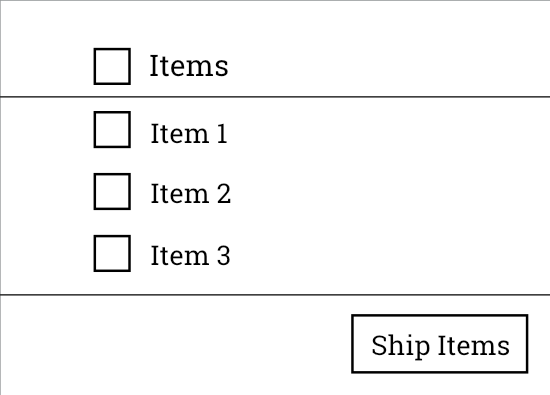 "Ship 2 Selected Items") might also reduce any potential ambiguity between the two buttons, when there's a selection active. This is a very interesting question. I think that the buttons create more cognitive load than they should. I would try to break down this small process in 2 steps. One is the selection and the second is making the choice of shipping. "What would you like madam?" "I'll have them all please." (Pointing at the nearly empty tray of cheese-and-onion pastries). "Do you want the three of them or all of them?" Point is that if two sets are exactly the same, why offer both? And how would you argue omitting a button saying "Ship all but the last one"? Without more context it's hard to give a good answer: How many items may be on this list on average? What is the actual user story and use case? Not the answer you're looking for? Browse other questions tagged buttons interface actions or ask your own question. Should a flash message be used for toggle buttons that perform actions immediately? Segmented/Split “Save | As” Button? Should clicking on a checkbox and a table row produce different actions? Where to place “Change Status” button on a Order page that improves look and feel?